D.C. Bicycle Advisory Council: Is Metrorail hostile to bikes? Despite its faults, Metrorail is a good subway system. When compared to other systems in the country, it does double duty as a regional commuter rail and an urban heavy rail system. While that comparison seems natural to us only a few systems, like Bay Area Rapid Transit (BART) in San Francisco, travel as far and as frequently as Metrorail. That said, it's not perfect. Through countless blogs, reports, tweets and articles, the operations of the Washington Area Transportation Authority (WMATA) are subject to intense scrutiny. To some, its policies and practices seem to occasionally be counterproductive, making customers feel like they are imposing when they question why it takes a year to fix an escalator or why train operators sometimes allow 5 seconds for passengers to board and disembark trains at crowded stations. In one respect; however, Metrorail seems downright hostile -- when it comes to bringing bikes on its trains. Hopefully this will change as a result of the system's new effort to expand mode share to its stations; but there is some concern that the predispositions of the operators of the system is to limit bicycle accessibility and usability of its trains. The perceived hostility not be intentional but a result of an institutional compulsion to maintain an orderly and pristine cathedral to public transportation. Zachary Schrag, author of the book, The Great Society Subway: A History of the Washington Metro, outlines how and why a high level of architectural detail and aesthetic design were used to create a subway "suited to the grandeur and dignity of the world's richest nation.". Bicycles are not permitted weekdays between 7-10 a.m. and 4-7 p.m.
During weekdays outside of the hours above bikes are permitted but limited to two bicycles per car. Bicycles are permitted all day Saturday and Sunday as well as most holidays but are limited to four bicycles per car. Bicycles are not permitted on Metrorail on July 4th or other special events or holidays when large crowds use the system. Folded bicycles are allowed on Metrorail during all operational hours, but must remain folded and inside a carrying case or bag during weekday peak hours. Bicycles are prohibited from using the center doors because they are "emergency doors". Bicycles longer than 80" long, 48" high, and 22" wide are prohibited. Tricycles, training wheels, tandem bicycles or recumbent bicycles are prohibited. Bicycles are not permitted on escalators. Riding bicycles in stations, on platforms or on trains is prohibited. While wheeling your bicycle, keep both wheels on the ground and the kickstand up. There is no additional fee for riders to bring their bicycles on a bus or railcar. At all times, Metro Station Managers or Metro Transit Police may exercise discretion to temporarily deny cyclists access to station mezzanines and platforms during periods of passenger congestion until the congestion is cleared. Bicyclists under 16 are prohibited without an adult or someone over 18. Adults are not permitted to accompany more than one child with a bicycle at a time. 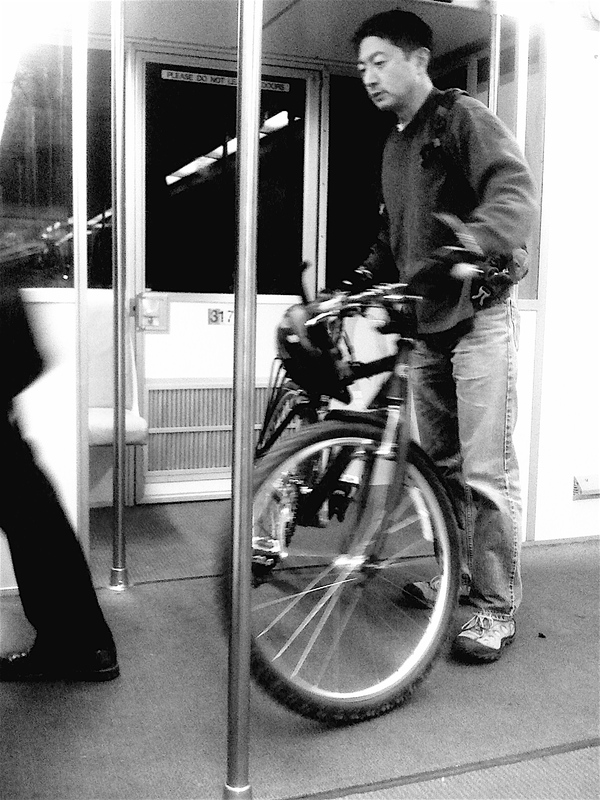 When it appears that a bicycle will cause an inconvenience or possible injury to other passengers waiting for an elevator, bicyclists must wait for the next elevator. Bicyclists are prohibited from using Metro property such as, but not limited, to poles, seats, and doors to support their bicycles. In case of emergency evacuation of a Metro train, and/or upon direction of a Metro Train Operator, Metro Station Manager, Metro Transit Police or city/county police or fire officials, bicycles shall be placed on top of the seats and left on the trains. Bicycles must be clean, free of excess grease and dirt, and not have sharp projections. Bicyclists are prohibited from allowing their bicycles to interfere with passengers on the platform when boarding or leaving train. If these guidelines are not observed, bicyclists are subject to local fines and/or arrest by Metro. Additionally, the public conduct ordinances of the respective local jurisdictions provide for the possibility of fines and/or arrest and prosecution for violation of those ordinances. Sure, some of these prohibitions or guidelines are warranted. What passenger wants to have a bike with prohibition #19 oozing out of near their freshly-pressed suit? Committing prohibition #10 on a platform just isn't smart and when the crush of rush hour is upon the District, it may be prudent to employ prohibition #1. When taken together; however, the perception is that a bicycle is a potentially dangerous device. The tone of the policy implies that the system is burdened by bikes and if it could, it would restrict them entirely or at least regulate them as they did in the past when they required a permit to travel with a bicycle (page 8). According to prohibition #16, if a bike potentially could cause an inconvenience, make your bike stop what its doing and beg for forgiveness. Sorry parents with your children just learning to ride, prohibition #8 applies to you. If bicyclists do not follow the guidelines, they are subject to prohibition #22. "Regardless of any other rule, bikes are never allowed on crowded cars. Use your good judgment and only board cars that can comfortably accommodate you and your bicycle. Hold your bike while on the trains." Again, the tone appears much more accommodating, like BART wants bicyclists to transport themselves and there bikes - together. BART assumes that bicyclists will use common sense and be courteous. In New York City, where the Metropolitan Transportation Authority (MTA) operates one of the largest subway systems in the world, it could be assumed that because the system is old and the railcars are very narrow when compared to the width of Metrorail cars that they have restrictions that are equal if not more stringent, that violation of the rules would be punishable by jail, fine or worse. "Courtesy + common sense = bicycle safety. Consideration for others along with reasonable judgment help produce a safer, more comfortable environment for everyone, including bicyclists." Metro's policy toward bikes appears much more restrictive because it implies a certain level of discomfort with allowing bikes on its system. If the words "stroller" or "suitcase" replaced bikes, the restrictions would seem a little silly. Actually, many of the rules regarding restrictions on use of the center doors and avoiding boarding during peak hours are the same across each system, it's just that Metro appears to want to ensure your compliance -- or else. Metro now has a great opportunity to change its tone regarding how it interacts with the bicycling public. Its plan to encourage access to its stations will mean that more people will be interested in not only bringing their bike to the station bringing their bike with them to their destination. Metro should examine how BART and MTA view its bicyclist and make an effort to change its bike-related rules and its tone. After all, changing some of the more interesting rules, like #12, would be a step in the right direction.